(LOUISVILLE, Ky.) – LG&E and KU announced today the completion of a modernization effort at the company’s historic Ohio Falls Hydroelectric Generating Station in Louisville. With the upgrades now in place, the facility is poised to enter a second century of generating clean, low-cost energy by harnessing the natural power of the Ohio River. In addition to Ohio Falls’ 100-megawatt generating capacity, the company also produces hydroelectric power at its Dix Dam facility in Lake Herrington near Harrodsburg. Also built in the 1920s, Dix Dam has undergone its own upgrade in recent years to boost reliability and performance, increasing capacity from 24 to 33 megawatts. E.W. Brown also has Kentucky’s first universal solar facility that has a generating capacity of 10 megawatts. For more information on LG&E and KU’s renewable offerings for customers, click here. 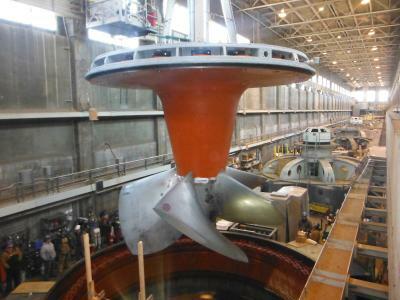 A new, state-of-the-art turbine is lowered into place during the modernization effort at the Ohio Falls hydro station.